After a bit of a drought on the ideas front, it was great to finally find some inspiration tonight after work, especially when it was brought about by two of my favourite challenges. 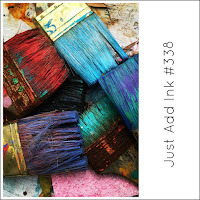 Just Add Ink has an inspiration photo this week. I love the colours, especially the rich blues and purples with the touches of metal from the brushes. I paired it with the sketch at CAS Colours and Sketches. After sponging and blending the masked vertical column, I sprinkled it with water to get some spots of lifted colour. This not only gave some interest but it helped to suggest rain or tears, which goes with the sympathy sentiment. 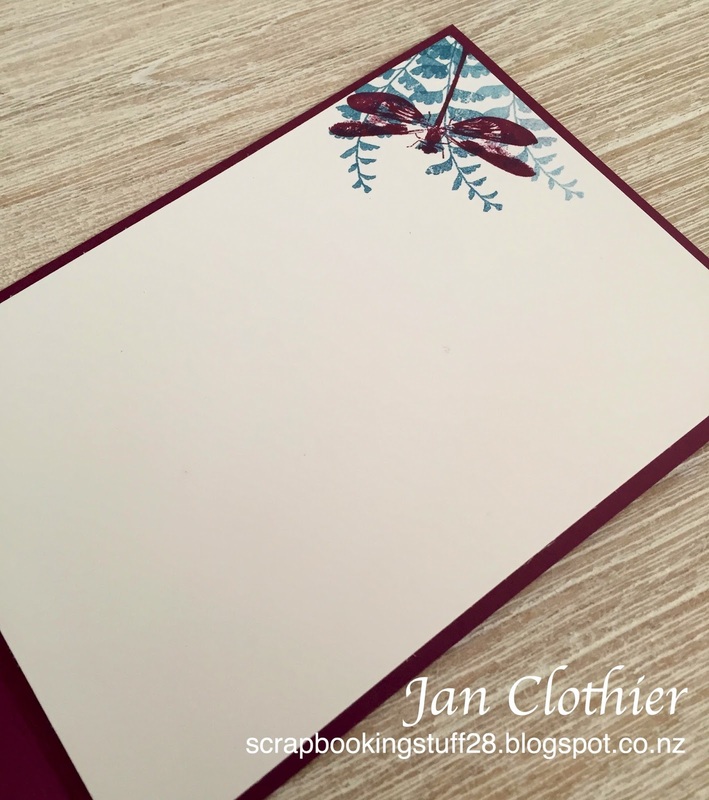 After stamping the images in ink, I added in some copper embossed leaves at the bottom and some copper splatters at the top, adding to the rain effect. Update: Delighted to get an Honourable Mention at Just Add Ink this week. Other: Copper embossing powder, Sponges, water, masking tape. Thanks for playing along with us at CC&S! Your card is beautiful! 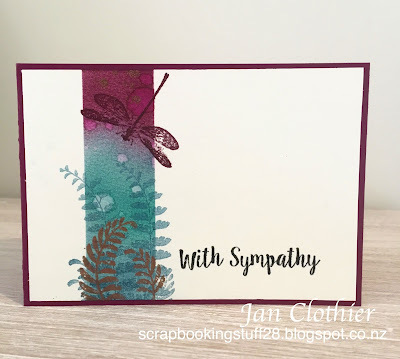 Wonderful colors - love the deep hues for a sympathy card! 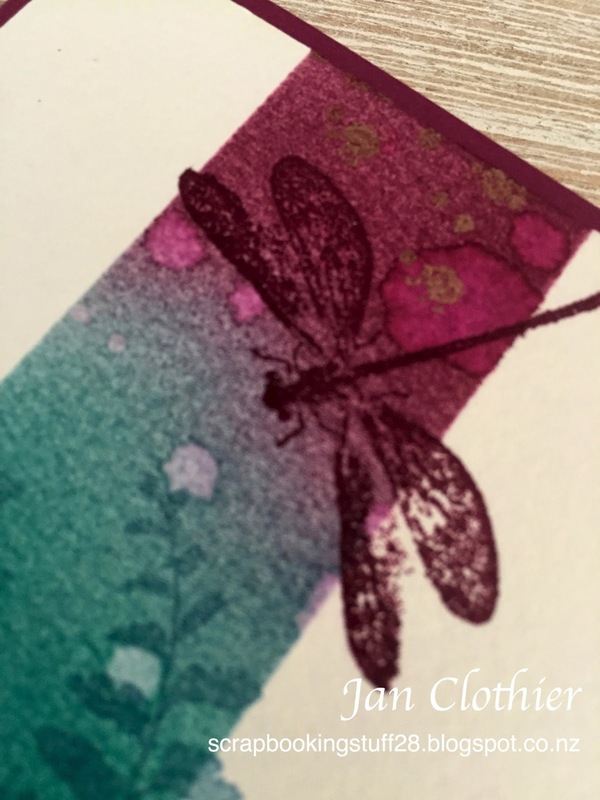 Loving your beautiful colours and the dragonfly and leaves look quite spectacular against them. Thanks for playing at CC&S. The colours you've used here are wonderfully vibrant. It's a beautiful card. 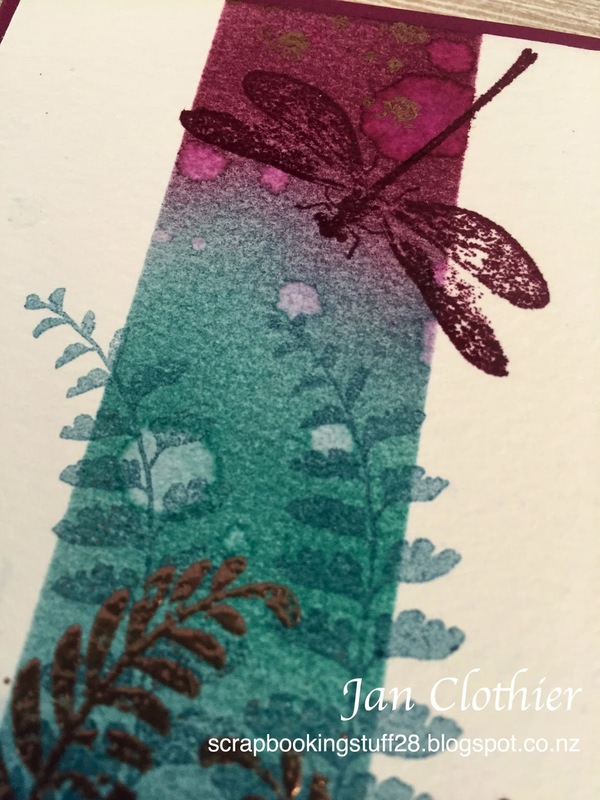 Jan your colours are wonderful deep jewel colours and transition beautifully. I love the simple stamping details you added over the top - so effective! Thanks for joining us at Just Add Ink this week. Jan, this is beautiful! The subtle copper-embossed elements are a lovely finishing touch. Thanks for playing along with us at Just Add Ink this week. This is a truly beautiful sympathy card. Congrats on your well deserved honourable mention!